Iceland is one of the countries I cannot get enough of, I love to visit it again and again. Every time I have had the pleasure of going to Iceland it has resulted in new adventures and new impressions. Last year we visited the western parts surrounding Reykjavik, but this year we went more Eastover. The plan was to be staying just south from Vatnajökull and some 90km west of Höfn, focusing on the coast, glacier and icebergs. The trip did prove itself to be much more than planned, there was a abandoned Viking movie set, in stunning surroundings, Aurora Borealis, waterfalls, ice caving, canyon hike, stunning coastal sites, caves at Vik and more. Aurora Borealis, the northern lights, we was arriving to Iceland with forecast on our side. We had a fairly long drive from Keflavik to Vatnajökull. The stars was bright in the skies, with little if any light pollution. It is one of those things that has to be experienced bodily, live-in-person to be understood. Otherworldly undulations of colorful light is amazing, at times its almost like its a living being, other times it an amazing backdrop. Aurora Borealis over Vatnajokull. Usually seen in shades of bright and glimmering green and aqua, more rare sightings of red and blue lights also occur. Aurora Borealis over Vatnajokull, Otherworldly undulations of colorful light is amazing, at times its almost like its a living being. Waterfalls, everywhere you go there is stunning sites, adventures to be found experiences beyond what you might expect. One of the days we went for a drive, no particular destination, the plan was to go as far at the south route as we wanted, and stop for whatever we found interesting. This time it was a small waterfall conveniently near the road that caught our attention, it didn’t look of much to begin with, but it turned out to be a hidden gem. 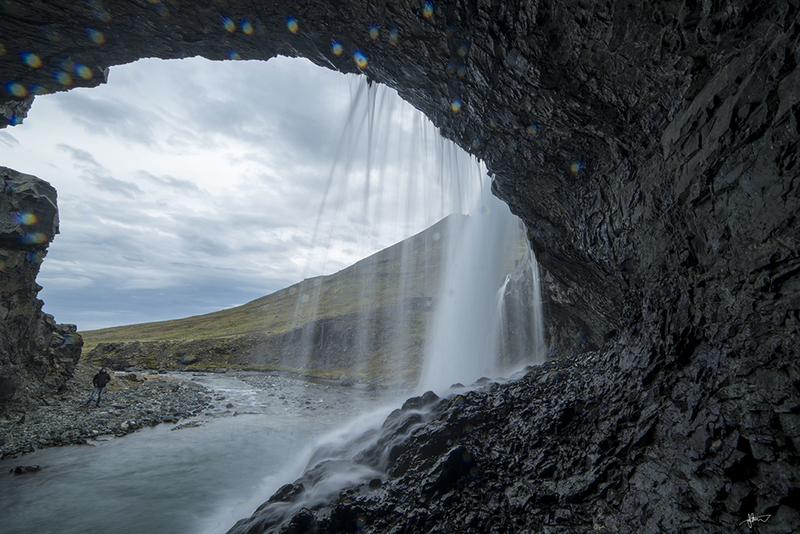 The fall hides a cave, which allowed for visiting the fall from a very special viewpoint. Reynisdrangar sea pillars at Vik in Myrdal. 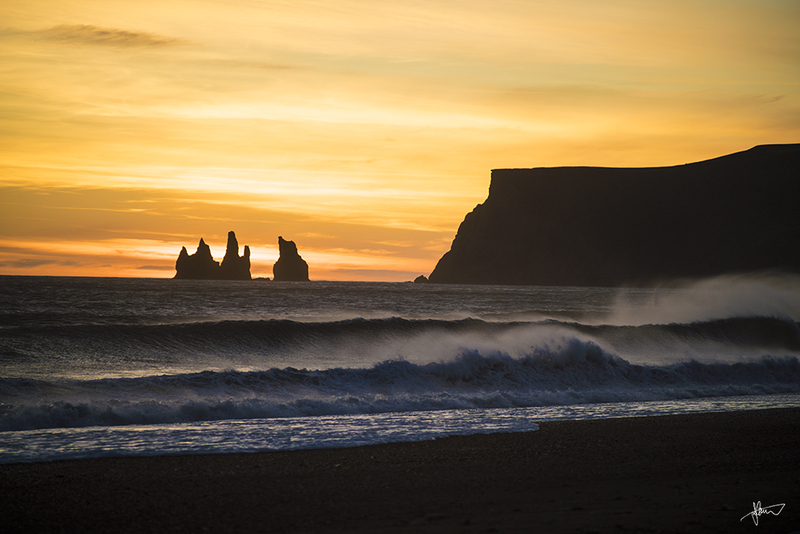 Vik is a small village of 300 inhabitants with a view towards the black beaches with this visual trademark. Folk legend says there were two trolls pulling a three-mast ship to the shore unsuccessfully, but were caught by the sunlight at dawn and turned into stone, as happens to trolls when they stay out until dawn. So there they sit just outside the beach forevermore. The church and the sea pillers might be the most known trademarks of Vik, but by far the only attractions in that area. The black sand has a major appeal on its own, the roaring ocean waves are powerful and chilling, and furthermore there you can see spectacular patterns of basalt columns that nature has created. Reynishverfi at vik, the black sand beach at Vik. The visit to the beach was a surprice to me, for some reason I expected fine black sand, but the beach was actually various sizes of shiny black pebbles and stones the expirence was windy, rugged and wild. Waves rolling in, spraying water in the air. This apocalyptic-looking landscape brought an image of Iceland’s violent present and past to my mind, an image of melted lava flowing down to the water, being instantly cooled as it touched the water. A word of warning! Please do read this, the waves at the sand beach can be extremely powerful and deadly. The seemingly calm ocean could send a sneaker wave high up on the beach without warning. Mind yourself and your children to avoid being caught helpless in strong current. Stay clear of the waves and keep attention to the water at all times. Here is a video of how real the danger is, do watch at least until 2:10 into the film clip, its rather scary. Viking Village, By luck we took a small gravel road twisting away and down from the main route between Höfn and Djúpivogur. It turned out to be a remote Viking village, though it looks very authentic it is not, it seems the site was constructed in 2010, with the intent to serve as a backdrop of a the film “víkingr“. The movie set was abandoned, but the local farmer told us that plans was in the making for restarting to takes. The most striking feature of the village is the buildings with the backdrop of steep surrounding cliffs. Islandic horses grassing on the fields outside the village making it almost indistinguishable from the real thing. The main building inside the village, the doorway is nicely decorated. Jokulsárlón, Iceland’s largest lagoon is home to stunning multi-colored icebergs which bob in the light blue waters of the lagoon. Formed entirely from glacial melt, Jökulsárlón is situated directly next to Iceland’s largest glacier. The colours of the icebergs is deep blue in color. from time to time is a loud crack heard and big chunk of ice falling from them into the water. Ice caving at Sveitarfélagið Hornafjörður glacier. The ice cave is an result of two glacier tongs rumpling towards each other. It seems the ice takes on the blue of the sky, it can in fact appear blue on cloudy day. The tunnel of ice that resembles the kind of barrel wave surfers dream. Some caves are only accessible in below zero conditions for example if there is water in the floor that needs to be frozen over to walk into the cave. This Tunnel is fairly accessible all around the year. Canyon hike at Fjaðrárgljúfur Canyon, with its 100 m deep cliffs runs for about 2 kilometers with the Fjaðrá river flowing through it. The steep walls and winding water is close to impossible to describe in words and photos. Its a place worth to visit, and fairly accessible by car as it is located near the Ring Road, not far from the village of Kirkjubæjarklaustur.